Quality Australian-made debris cleaner for removing overspill and debris from under conveyer belts in manufacturing and mining applications. Available in 2800mm and 3300mm reach. Tungsten teeth are located between the paddles to loosen harder materials. 350mm paddles & teeth can be replaced. Optional hard facing of paddles also available. Debris cleaner sizes include 2800mm & 3300mm reach with a heavy duty 2in. chain that features an Anti-back Flex design which prevents the chain links from flexing back. A bolt-on slide frame allows the Debris Cleaner to be side shifted and attached to most skid steer loaders - most frame options are available. 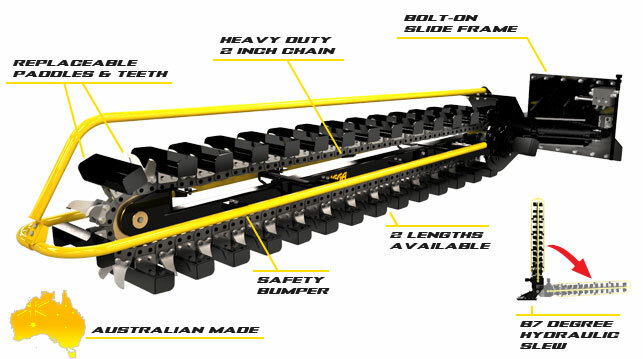 Bumper & safety bar surrounds chain for added safety as well as protecting the paddles. The Digga Debris Cleaner boasts hydraulic slew up to 87 degrees (right from centre) with only 1 set of hydraulic machine remotes required. Made from high quality components, our Debris Cleaners - including the gearbox and rollers, are fabricated in-house in Australia to ensure longevity, better performance, and a quality product all round.